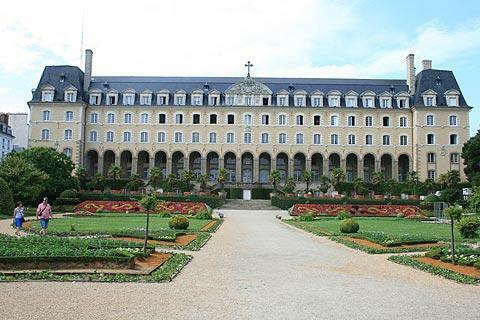 Rennes is located in the Ille-et-Vilaine department in the centre of eastern Brittany, and is both the capital of the region and a busy regional hub. 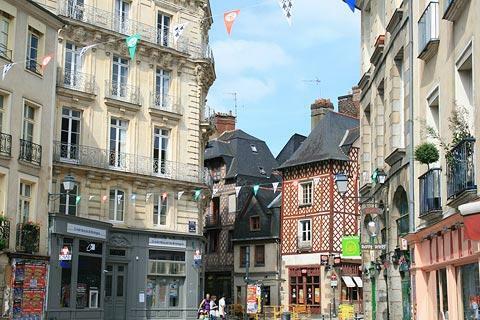 It is true that, as with many large towns, Rennes is slightly disappointing as you arrive in the town through areas of industrial development...but head for the historic centre and Rennes quickly reveals a charming medieval centre and an elegant 18th century sector to the town, a perfect place to start your visit. The city centre is quite compact and easy to explore on foot, with the medieval area in the north and west of the centre. 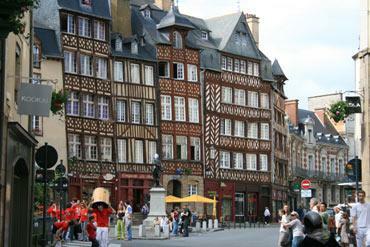 The most interesting part of your visit is the medieval centre of Rennes. Unfortunately a large part of this was destroyed by a fire in 1720 that raged for a week and burned down more than 900 houses and buildings. 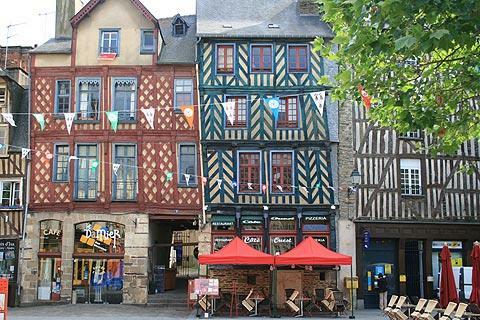 The part which survived, with the impressive tall half-timbered houses that you will have seen in almost every postcard of Rennes, is in Rue du Champ-Jacquet and the streets to the west and south of here towards the Place des Lices and the cathedral. This part of the town is the most picturesque and where visitors spend the most time, ambling along the streets admiring the ancient buildings and pausing for a coffee. Many of the houses have been painted in bright colours and incorporate interesting historical carvings. France This Way comment: the Place St Ann is a lovely place to stop for lunch in medieval Rennes whilst admiring both the lovely medieval buildings around two edges of the square and the Cathedral on the other side. 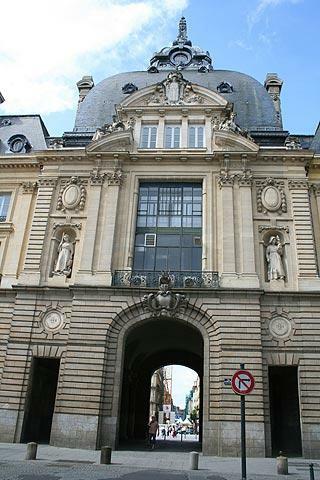 Just off the Rue de la Monnaie you can see the Portes Mordelaises, the gateway which was the main entrance to the medieval city. 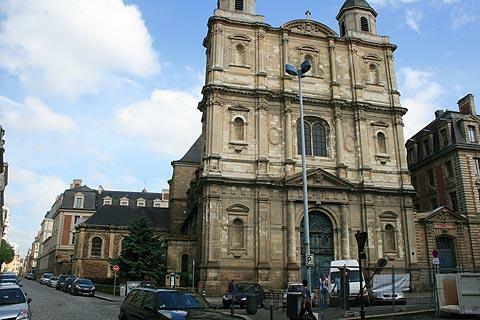 Next you can visit the Cathedral of Saint-Pierre. The cathedral has retained its original 16th century facade although the rest of the cathedral is an 18th-19th century rebuild. The interior is in the neo-classical style with numerous columns and lots of plasterwork and gilding, and includes a grand altarpiece from the 16th century. 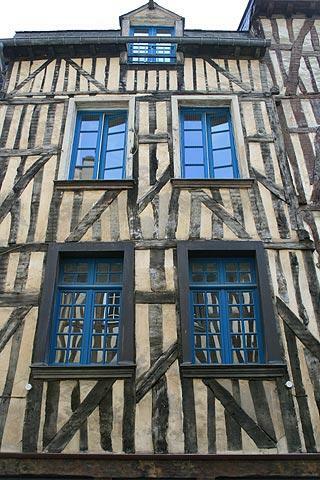 After exploring the medieval quarter you can explore the more recent part of Rennes, which has lots of grand buildings typical of the 17th and 18th centuries. One of the most imposing is the splendid mansion called 'Hotel de Blossac', and also here in Rue du Chapitre you can see the Hotel de Brie. 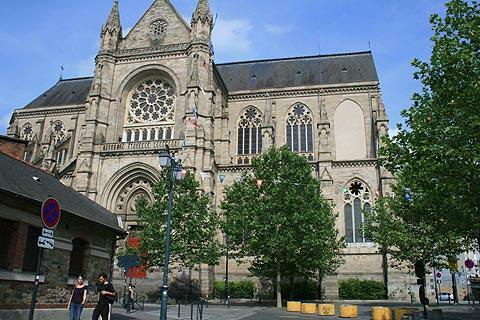 The Place de la Marie with its lovely Theatre building is a treat and is also a popular venue for events in the town. When I was there there was a ‘farm in the town’ exhibition complete with pigs, cows and vegetable gardens! The most imposing building in the square is the 18th century town hall (the previous town hall was destroyed in the great fire of 1720) with imposing classical style wings either side of a large belltower. The lovely St George Palace and Gardens are easily visible as the palace is raised up from the gardens and the gardens, planted on a slope, are a mass of colour. 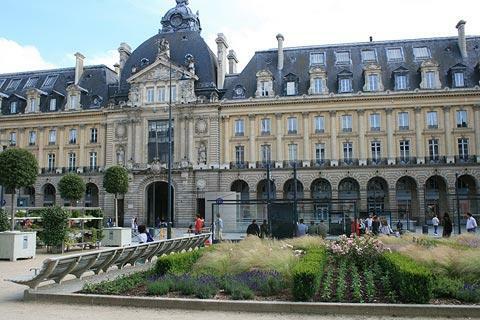 A little further along is the Place de la Republique with the splendid Palais du Commerce. This is an attractive square with a pleasant contemporary garden area in the middle. To the north-east of the Place de la Mairie opposite the gardens of the Place du Parlement de Bretagne is the parliament building. Despite being very damaged by a fire in 1994, five years of rebuilding have restored the impressive building. Dating from the 17th century, the parliament contains several very grand rooms and ornate ceilings and other rooms of interest. The Rue la Fayette, an elegant pedestrianised street in the centre of Rennes is a good starting place if you are looking for up-market shops. To escape from the bustle of Rennes for a while you can explore the pleasant Jardin du Thabor, next to the Church of Saint Melanie. 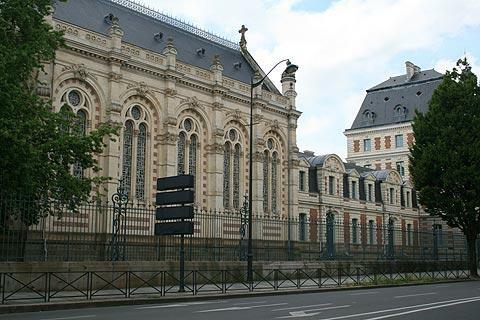 There are two noteworthy museums in Rennes, the Musee de Bretagne and the Musee des Beaux-Arts. Both are in the same building on the Quai Emile-Zola in the south-east of the town centre and both deserve a visit. The first explores the history of Brittany and the second has a good collection of paintings from medieval times to the 20th century. 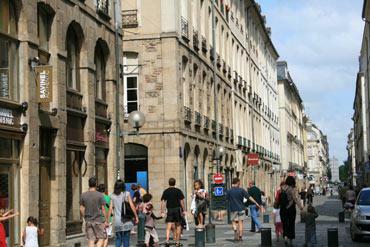 Rennes is a student town with a vibrant night life. Head for the Rue St Michel if you are in town for the evening. Rue Saint Georges, Rue St Malo and the Place des Lices are also good places to find lots of activity. At the beginning of July every year Rennes hosts its celebrated ‘Tombées de la Nuit' festival. This is a mixture of music, light shows, juggling and fire-eating and the whole town gets involved. A few French towns now do these light shows where buildings are lit up in a mass of vibrant colour - they really are well worth tracking down.